present your argument. Its ideal length is 2000-2200 words and mostly such essays get good marks. Is colonial mentality impeding Pakistan’s progress? Are modern wars not holy wars? Great nations win without fighting. A narrative essay is a description of some past events, and personality in which the writers share their personal experience. Writing a narrative essay provides the examiner an opportunity to get to know and understand you better. During the process of writing a narrative essay, you will learn ways to articulate personal experiences to inform and entertain others. Narrative essays provide human interest, spark our curiosity and draw us close to the storyteller. 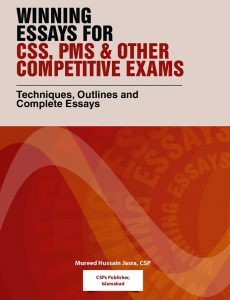 However, narrative essays never appear in any type of competitive exams like CSS/PMS. The type of the essay that always describes concepts, ideas, events, social evil etc. in the farms of primary and secondary statements. The type of the essay that requires your stance in the form of yes or no. 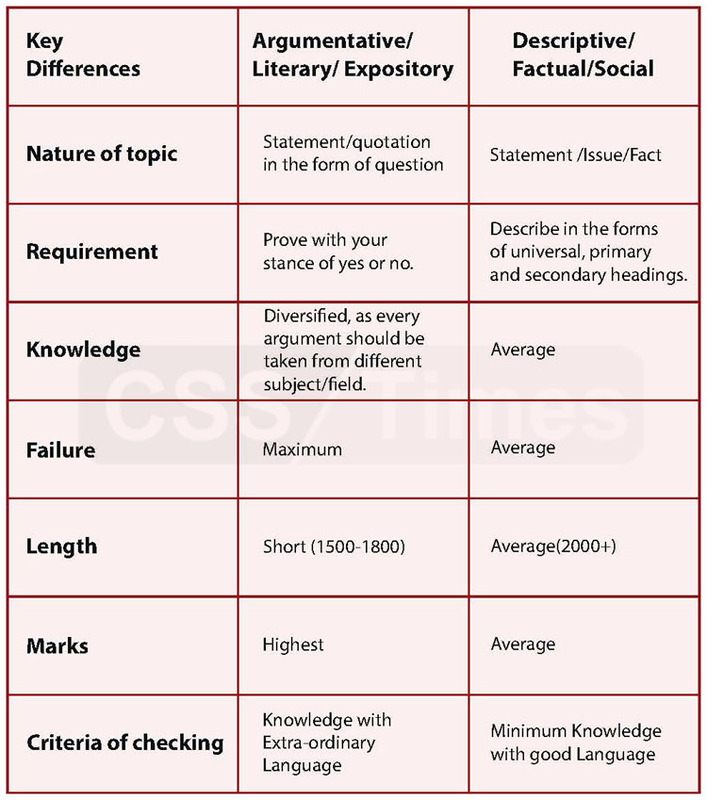 In short the argumentative essay is a specific type of writing in which a student chooses a topic (often a controversial topic), researches it extensively, and then uses the evidence gathered in the research process to establish his/her opinion or position on the topic in an essay designed to persuade others to share that opinion. 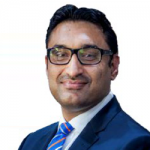 Mr. Mureed Hussain Jasra boasts of a diverse professional background. Being a Civil Servant, he has served at important positions in the Federal Secretariat and autonomous bodies dealing with the important policy level matters. Prior to joining Civil Service of Pakistan, he served as a lecturer of English in the Federal Government of Pakistan and won accolades in academic circles and intelligentsia for his professional commitment and devotion to work. 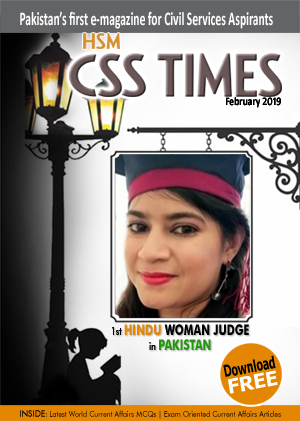 Mureed Hussain Jasra's current fame among the CSS aspirants owes to his stellar success as being the most towering CSS coaching teacher and mentor. Under his careful mentorship, many young men and women have won distinctions in the CSS/PMS competitive examinations and are now serving the nation in different capacities. He regards teaching as the singular driving passion of his life and has founded Civil Services Preparatory School for the young aspirants. Mr. Jasra is an avid reader of books and loves debate on history, culture, literature and governance. He is Masters in English Literature. Mr. Mureed Hussain Jasra boasts of a diverse professional background. Being a Civil Servant, he has served at important positions in the Federal Secretariat and autonomous bodies dealing with the important policy level matters. Prior to joining Civil Service of Pakistan, he served as a lecturer of English in the Federal Government of Pakistan and won accolades in academic circles and intelligentsia for his professional commitment and devotion to work. 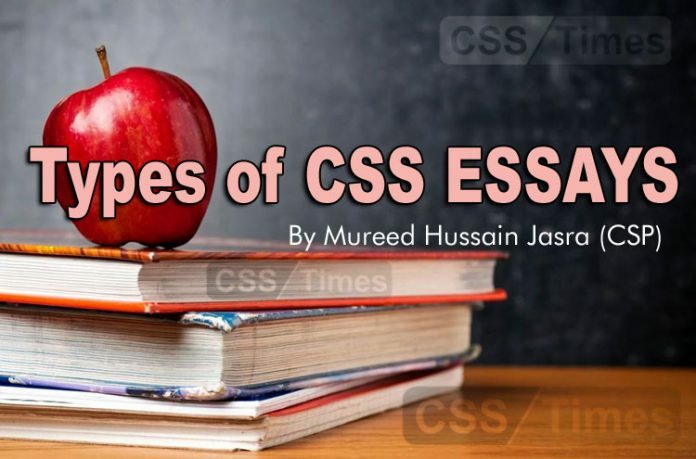 Mureed Hussain Jasra's current fame among the CSS aspirants owes to his stellar success as being the most towering CSS coaching teacher and mentor. Under his careful mentorship, many young men and women have won distinctions in the CSS/PMS competitive examinations and are now serving the nation in different capacities. He regards teaching as the singular driving passion of his life and has founded Civil Services Preparatory School for the young aspirants. Mr. Jasra is an avid reader of books and loves debate on history, culture, literature and governance. He is Masters in English Literature.